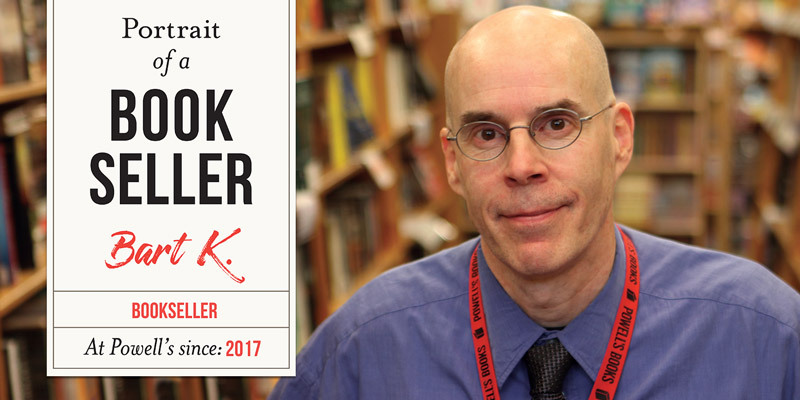 Portrait of a Bookseller - Bart K.
Portrait of a Bookseller: Bart K.
Imagine the best job in the world. Now imagine that I have it. Pnin by Vladimir Nabokov and We Are Never Meeting in Real Life by Samantha Irby are my most recent reads that I loved. You couldn’t find two more different writers who are both brilliantly hilarious in their own fashions. Five things: Our customers are superlative, my colleagues are continual sources of joy, and books, books, books. Share your favorite customer quotes. I don’t move my lips as I read, but my ears do wiggle slightly. Share a memorable experience you've had on the job. An out-of-state customer was looking for a copy of Alex Haley’s Roots as a graduation gift. After I located her a signed hardcover, she was visibly moved, and exclaimed: “You made my day, my week… and my year!” So I have that going for me. When you’re not reading, what do you like to do in your free time? What do you mean, “not reading”??? What makes for a good book in your eyes? Recommend a book or author you think everyone should read. A Naked Singularity by Sergio de la Pava is a work of absolute genius. Without sounding bossy, I think The Warmth of Other Suns by Isabel Wilkerson should be required reading for every U.S. citizen. Oh, and The Secret Diary of Adrian Mole, Aged 13¾ by Susan Townsend might be the funniest book I’ve ever read. What are your biggest literary pet peeves? 1. Stories set in Brooklyn that are written by MFA grads who attended the Iowa Writers’ Workshop. 2. Dream descriptions that go on for more than a line or two. 4. People who complain at length about their literary pet peeves. Do you have any odd reading habits or book rituals? 1. I don’t move my lips as I read, but my ears do wiggle slightly. 2. Anytime I stop reading and close a book, I always check to see how far my bookmark has moved. 3. I read LOTS of books simultaneously, but not at the exact same moment, of course. However, I do like the idea of arranging a dozen open books on a table and standing over them, scanning them, and then turning 12 different pages and doing it again. 4 Responses to "Portrait of a Bookseller: Bart K."
Enjoyed your 'Portrait'. Thx much for sharing. I, too,read incessantly. Wonderful habit, eh! I used to let my young kids stay up as late as they wanted - as long as they were reading something of value. The above two comments made me laugh! Very funny! Hope to run into you when I get to Powell's in Portland. I wish Powell's would open a store at The Shops of Salishan on the Oregon Coast so we don't have to drive into Portland when at our vacation home. Agree with you on pet peeves. Wow, he seems nice. And smart! Really smart.